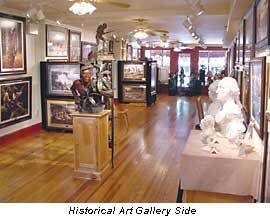 Robert Griffing, John Buxton, David Wright, Pamela Patrick White, Doug Hall, Todd Price and other top Eastern Indian artists offer their works through this formal gallery in historic Gettysburg, PA. The gallery provides a showplace style atmosphere for the art of John Buxton, Robert Griffing, David Wright, and other historical artists. We also feature sculpture and reproduction period equipment from some of the world's finest craftsmen. Click one of the icons below to view the paintings of our featured artists or browse our Print Inventory for a complete listing of available items. The latest items are conveniently marked "New" on this print inventory section. You'll also find originals conveniently grouped together and accessible by clicking here. AN AMAZING JOURNEY ART BOOK - NOW Available!